Infrared Grills aren’t a new way of grilling, they’ve been around since the late 70’s. Also referred to as IR grills, they are becoming more and more popular today because of the way they cook food. 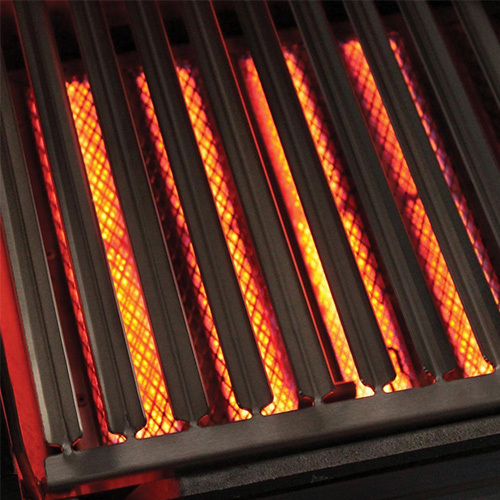 In this guide, we’ll take you through everything you need to know about infrared grills. We’ll go over some infrared grill reviews, look at the pros and cons of infrared grills and give you some examples of what makes the best infrared grills. 1.2 What is an Infrared Grill? 1.3 How does an Infrared Grill work? 1.4 Why do you need an Infrared Grill? An infrared grill is a grill that has a burner that heats up and produces infrared radiation. This is different to standard gas grills that cook through a convection system. Convection is where the heat flows around the item via air or water etc. Infrared uses radiant heat. Radiant heat doesn’t require a medium to travel through so can travel through a vacuum. The Sun heats the Earth through radiant heat, for example. This means IR grills can produce a very consistent and even cooking area, regardless of the surrounding temperature or medium. (It won’t lose lots of energy by heating a pan, for example). Infrared cooking maximizes flavor, saves on fuel and is much more convenient than standard gas grills. All food has a moisture boundary that is made up of a layer of water molecules. Standard gas grills have a tough time penetrating this boundary without disturbing it. When it’s disturbed the food is dried out due to the hot air. As Infrared is a type of natural electromagnetic radiation, it can penetrate and cook the food without breaking down the moisture barrier. This produces cooked food that is a lot juicier than what standard gas grill can produce. Some models can help to retain up to 35% of the moisture content of the food which adds huge amounts of flavor and tenderness. There are several ways that the different manufacturers of infrared grills have utilized infrared to cook, but the basics are the same. There is a gas burner, that is usually made from stainless steel to prevent rust. This lights in the standard way, but it heats the IR element that is placed above it. There are many types of IR elements. A usual one on the cheaper models would be made from stainless steel. The higher-end models tend to use ceramic or even glass to radiate the heat. These IR elements are placed just above the gas burner and are usually built into the burner themselves. The cooking grid is then placed just above those, ensuring very even heating. There are several differences and advantages of using an IR grill over a standard gas grill. The main use of IR grills is to sear food at very high temperatures. Infrared grills can easily get to over 1,000°F (538°C), with some reaching 1600°F (871°C) and it’s these high temperatures and the fact that a lot more moisture is held in the meat that makes them so good at searing food. For the most part, they are very good at general cooking as well, they just reach very high temperatures very quickly. Being able to reach the high temperatures quickly means that they are great for quick and easy grilling. 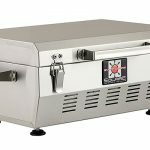 If you’re looking for a new grill that has the ability to sear food to perfection and that can get up to temperature in just a few minutes then an Infrared grill might be what you’re looking for. We’ll take a more in depth look at the pros and cons of an infrared grill next. As mentioned before, IR grills are brilliant at searing. This is because of the very high temperatures and ability to lock in the juices of the meat. They can preheat very quickly. Some can reach these high temperatures in as little as 3 minutes. They cook food faster. The way infrared cooks food is by the waves of IR travel through the food and the high amounts of energy they contain is distributed to the medium they are passing through, in this case the food on the grill. This makes them much better at cooking faster. 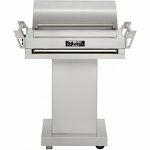 As IR grills aren’t reliant on flames and convection to heat the food they can provide a much more even source of heat. Convection relies on the hot air passing over the food so can be disrupted by wind, or poor air flow through the grill. Whereas IR goes exactly where you want it, providing a much more even and consistent heat. Even though infrared grills can reach very high temperatures and pre-heat very quickly, they don’t use as much fuel as standard gas. If you compare a traditional gas grill and an infrared gas grill the IR grill will get up to temperature quicker whilst using less fuel to do so. Infrared grills also keep grilling as consistent as possible by reducing the flare-ups from the grill. One of the most inconvenient hassles of standard grills are the flare-ups. These are highly unpredictable and make for an even less even cooking surface. Some brands such as TEC, that use a glass panel as the heat distribution system which almost completely eliminates flare-ups. IR grills are also very easy to clean. The high temperatures allow you to burn off any food spillage. Just turn the temperature all the way up, burn the food particles off and wait for it to cool. Then simply brush and wipe clean! As infrared is a radiant heat it can perform just as well in colder areas. Infrared grills tend to be more expensive than standard gas grills. This is because of their high performance and the more expensive IR grills are made from very high quality materials. Because of the very high heats it’s easy to burn the food if you’re not paying attention. After a while and a few practice runs with your new infrared grill you’ll get used to it. Some grills will simply be too hot for certain foods. Vegetables and fish sometimes require lower heats and if your infrared grill doesn’t have a wide temperature range you might not be able to successfully cook them on one. The Char Broil Signature 2-Burner Grill is one of the more affordable infrared grill options. It’s a two burner grill with 325 square inches of cooking space. It has an additional 120 square inches of swing away rack for warming. The Char Broil grills use a stainless steel tube burner, similar to those found on traditional grills, with a stainless steel metal heat emitter panel that actually emits the infrared radiation. A metal heat emission system is fine for budget models. It produces a good temperature range of around 300°F to 750°F (149°C to 399°C). This is a good range considering the price of the grill. You’ll be able to sear steaks easily and yet also cook some of the more delicate foods out there with some practice. The build is fairly good, it’s mostly stainless steel and feels sturdy. It isn’t a high quality stainless steel but you get what you pay for. Folding side shelves. These are also a decent quality and add a nice extra level of ease-of-use. Dual fuel and temperature gauge. Whilst we’re never 100% convinced with built in thermometers this one actually stayed really close to our digital one. We’d always recommend picking up a good digital meat thermometer but this works quite well. Having a fuel gauge built in as well is a very nice addition. Solid, stainless steel storage cabinet. Surefire Electronic Ignition system to make sure start ups are as easy as possible. 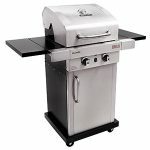 The Char-Broil Signature TRU Infrared 2-Burner Grill is a fantastic choice if you’re thinking of trying out an infrared grill. It’s not that big and in comparison to some of the higher-end models its feels a little cheap. It also doesn’t get up to the temperatures that make the higher end models such a joy to use, but for the price it’s a brilliant bit of kit. It pre-heats fast, the heat distribution is very even and you’ll be able to cook some of the best steaks and burgers you’ve ever tasted on it with ease. If you’re looking for a low-budget introduction to IR grills then this is one of the best infrared grills you can buy. Solaire are known for their IR grills. 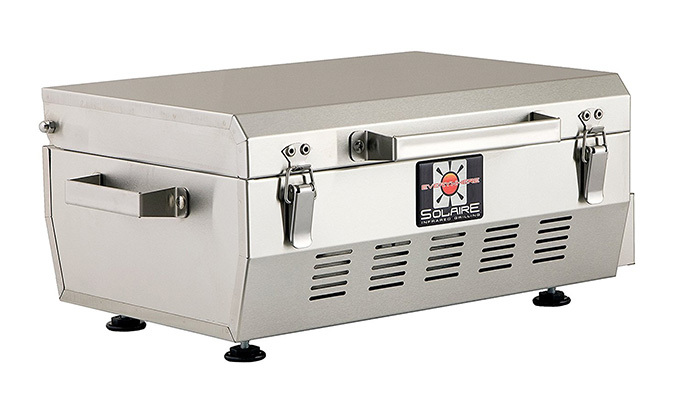 The Solaire Everywhere is a completely portable infrared grill that has a real infrared ceramic burner, a good quality build and is very reasonably priced. It has a 140 square inch grilling area, that might not sound like a lot, but should be enough for most camping or tailgating excursions. That is where this grill shines. It’s truly a portable infrared grill that can be used anywhere. Its ceramic burner can heat up in 3 minutes and as it’s ceramic it can reach temperatures of almost 1,000°F (538°C). That’s a lot of power in a very small package. Huge range of accessories so you can customize the Solaire any way you like. For example, there are portable stands, natural gas conversion kits an different mounting plates and grids. V-grate grid for improved flavor and grill lines. It also reduces flare-ups really well. High quality, 304 stainless steel grill. Ready to use out of the box. The only assembly required is to attach the handles. Brilliantly compact design for use anywhere. The Solaire Everywhere is the best infrared grill to buy if you’re looking for a cheap, portable IR grill that you can take anywhere. It’s well built, despite a few sharp edges, it’s ready to go out of the box and it produces some of the best steak we’ve tasted. The fact that it can get up to such high temperatures is an amazing quality for such a cheap grill. There are a few things that could be better though, for example the lid can’t be held open and also can’t be closed when cooking. This was a little inconvenient, especially when it’s a windy day. Also, we found the cooking area to be best in the middle of the grill, which was surprising because ceramic has a great heat distribution. Despite these small faults we still think this is the best portable infrared grill for the money and would definitely recommend it. The Broilmaster R3B is a dual burner grill. It uses one standard blue flame gas burner and one infrared burner. We think that this setup is ideal and is what we prefer to cook on. It gives you the versatility to cook at very high temperatures which are perfect for searing steaks and also lower temperatures to cook for delicate food, such as fish. You really don’t ever need another grill with the R3B. Both burners are 20,000 BTU burners that take up half the grill each. There is enough of a space between the two to ensure the heat from one doesn’t affect the other. For example, it’s fine to cook some fish and sear a steak at the same time. A cooking space of 442 square inches and a warming rack area of 254 square inches. A huge maximum temperature of 1600°F (871°C) to be able to sear anything perfectly. 10 year warranty for the gas burner and a 5 year warranty for the infrared burner. V-shaped grates to collect and evaporate fats and oils for maximum taste. Very even and consistent cooking area. The heat diffusion from the ceramic infrared burner is one of the most consistent we’ve tested. Overall, the Broilmaster R3B is one of the best grills we’ve ever tested. The fact that it can reach heats of 1600°F (871°C) makes it an absolute joy to sear steaks and cook burgers on. Having a standard gas grill included means you get the best of both worlds. It’s made from heavy-duty cast aluminum which means the build quality is great and the ability for you to confidently cook on both sides of the grill simultaneously without having to worry about heat spillage is brilliant. There are a few problems though. The base grill doesn’t come with any extras, so a mounting stand will cost you more. It also took quite a while to heat up at around a minute to get to maximum temperature, this is probably due to having both types of burner on the grill. Despite a few small flaws we think this is one of the best infrared grill you can buy and if you’re looking for a solid investment in the infrared grill market then this would be our choice. 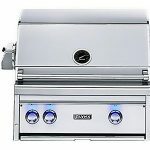 The Saber SS 500 is a 3 burner grill with an addition side burner. It’s made from commercial grade stainless steel and has an excellent finish. The build quality in general is fantastic and everything feels sturdy and really has some weight to it. All 3 burners are infrared with the side burner being standard gas. Compared to the Broilmaster we felt this was a little limiting but there is still plenty of versatility so it isn’t a huge problem. It has a primary cooking area of 500 sqaure inches which is enough for most family gatherings and more. Primary burner BTU’s of 24,000. This provides enough heat to sear any steak perfectly. An additional, secondary cooking are of 175 square inches to take the total cooking area to 675 square inches. Uses 30% less gas than standard gas grills. Very even heat distribution and no flare-ups because of a V-shaped grate design. Two internal halogen lights under the lid so you’re able to cook any time of the day. The Saber SS 500 is almost the perfect grill. It has 3 separate cooking zones so you’re able to grill 3 different things at once with maximum control. This is incredibly useful and works very well as there is very little heat spillage from one to the next. Whilst this is a brilliant grill, with exceptional build quality, we do think it is a little expensive. There are other models that provide similar features at lower prices. But they don’t have the same build quality as the Saber. So, you do get what you pay for in the end. Also, we do like the hybrid standard gas grill and infrared grill. If not having a standard gas grill isn’t a problem to you then the Saber is without a doubt one of the best infrared grills you can buy. TEC has taken the basic idea of infrared grilling and made it their own. The G-Sport uses a system where the cooking grid sits directly atop a radiant glass panel. The glass panel sits on top of a stainless steel burner that is one of the most durable and versatile burners available. The burner is rated at 22,000 BTUs and there is 309 square inches of grill space. Whilst this might not look as good on paper the magic happens in the glass. The glass panel distributes heat more evenly and efficiently than anything else we’ve seen. We got the temperature gun on it and it was basically perfect. This creates a joyous cooking environment and gave some of the best results. 304 stainless steel construction ensures long lasting and durable build. The detachable mount allows the actual grill to be transported and used on the go. Rapid preheat of 0°- 900°F (482°C) in 10 minutes (on high) with hood closed. 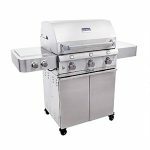 One over-sized fuel-efficient stainless steel burner that reaches higher temperatures (1400° F) while using less fuel than other grills. The reason this grill is more expensive than the others and yet still makes it on to our list is because it has the most consistent, even heating of any grill we’ve tried. It also has a huge temperature range and you can easily cook delicate meats and vegetables at lower temperatures on the IR grill. It has the build quality you’d expect from a product at this price range and also has a selection of brilliant accessories. You can even take the temperature down enough to smoke on this grill (with the smoker accessory), it’s that versatile. 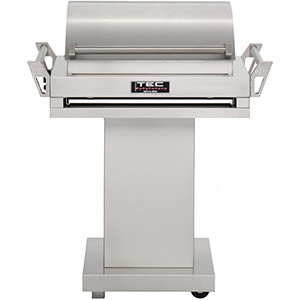 If you’re looking for one of the best infrared grill that money can buy then go for a TEC. A very close contender to the TEC is the Lynx L27PSR-3-NG. Not only does this grill provide a massive 685 square inches of cooking area (470 primary and 215 secondary) but it also has the most features built into an infrared grill we could find. It has two burners, one rated at 23,000 BTU and one at 25,000 BTU. It also has a built-in smoker box that can add amazing flavors to everything you grill. In addition to all this it has a dual-position internal rotisserie with a 3-speed motor to create one the most feature rich grills on the list. An array of ceramic briquettes to help ensure a very even heat distribution. An advance ignition system that uses a hot element positioned directly above the burner to ignite it quickly and safely. High-grade 304 stainless steel construction and assembly, seamlessly welded to eliminate grease build up. Spring weighted lid to assist in lifting and lowering the hood. Overall, the Lynx is a fantastic infrared grill. 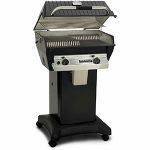 It can get up to temperature very fast and has so much versatility that you’ll never need another grill. The Lynx has a big temperature range so cooking seafood and vegetables is no problem. It also has small features, such as LED lighting on the knobs, that make using it at any time of the day incredibly easy. The downsides are the price and the need to plug it into an outlet. Also, this is a built-in model, meaning that it is designed to be built into an outdoor kitchen and is therefore not portable. 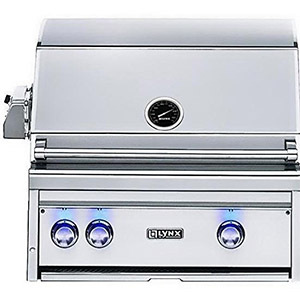 If that’s what you’re looking for though, then look no further as the Lynx Infrared 27 inch grill is one of the best infrared grills you can buy today. If you’re looking for a taste of infrared grilling but already have a grill you’re happy with and don’t want to shell out hundreds of dollars for a new one, then we have some options for you. Firstly, if you’re literally looking to try out IR grilling, which we highly recommend you do, then you can buy a very cheap Char-Broil TRU-Infrared Kettleman Charcoal Grill, 22.5 Inch Grill. Whilst this isn’t technically using IR to grill your food, it uses a specialized grill and charcoal to give the same effect. You get high temperatures, low flare-ups and a nicely even grilling surface. This is about as good as you’re going to get at the super low price range and can give you a taster to see if infrared grilling is for you. There are also some brands of grill that offer replacement burners for your pre-existing grill. One of the major manufacturers that do this are Blaze. The Infrared Searing Burner is an ideal replacement for your standard gas burner. They’re fairly easy to replace, depending on your grill. Here’s a video from Blaze Grills to show you how easy it can be to switch out your standard gas burner for an infrared burner. Hopefully we’ve covered everything you need to know to get you grilling on an infrared grill. If you have more questions then please contact us or ask in the comments.